The Healing is Always Christ: A Community of Believers in Christ Jesus Lay Their Hands to Pray for an Officer of the Law, Amen!~ PRAY for one another!~ The Sinner's Prayer for Salvation~ Encouraging You for Your Children! A Community of Believers in Christ Jesus Lay Their Hands to Pray for an Officer of the Law, Amen!~ PRAY for one another!~ The Sinner's Prayer for Salvation~ Encouraging You for Your Children! On a G+ community to which I belong, I saw this beautiful photo and was completely drawn into what was happening. A nice Christian fellow, Danny Gregorio, of the Jesus Christ Daily community, had posted this intriguing picture on the community site where we both belong. I do not know who took the photo originally. Looking at it again, I was particularly noticing that the people likely come from all walks of life: how wonderful and fascinating in a day where there is so much hatred, maligning, accusing, distrust and division. YES, there are many, many GOOD people out there and among you and me! We must hold onto that and them. 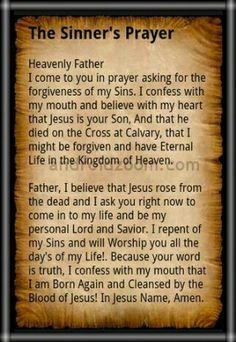 Please see A Prayer of Salvation below*** to be sure that you are with the folks who will go to God's Kingdom, Heaven, on that day that you are called from this Earth by Him. Good, bad, indifferent, or ugly in spirit, we are each forgiven by God when we accept His Son Jesus Christ. Ask God to forgive your sins, and do not reject Christ Jesus. Not to accept Jesus IS to reject Him, and God the Father cannot forgive you rejecting His Son (fully Man and fully God). I am the wife of a retired police officer. It is, indeed, WONDERFUL to see the believers laying hands on him for protection and service in his daily matters with the people of the town/city. My husband Royce was an excellent officer with people. He treated them fairly. He helped tens of thousands over the years. Sometimes people's dire needs and situations tore at his heart. He was the lead hostage negotiator for 20 years, a school resource officer, where he also belonged to NASRO (National Association of School Resource Officers) and traveled around the country to make presentations, teaching other officers what a school resource officer does and to also inform other professionals working with youth at school, at first middle and high school, but now grade schools. Royce worked tirelessly to begin and to develop a local program that is also national, NAMI, (National Alliance for Mental Illness) for police and mental health to work together to help in the much-needed area of folks who have mental issue needs and also get involved with the police and authorities, such as battered women, domestic abuse, and many other situations that most of us are unaware. Royce made the program for a Saturday class from juvenile drivers who had moving violations so that their car insurance would not grow up. He conducted these classes on Saturdays for years and years. He had four hours of information, including people's first-hand telling of events where youth were injured badly in car accidents or had died. One such person was a mother where 5 teenage girls were in a terrible accident- two girls did not survive the crash and all of them were significantly effected. The first responders were greatly affected emotionally, many to this day, like my husband. Most of my husband's students in the classroom would be crying by the end of the morning those Saturdays. I sat-in one day...it was gut-wrenching, including presentations by parents whose young people had been very hurt or passed away because of, often, speeding and other moving violations of the law in vehicles; sometimes the teens themselves had made the violations; other times, it was circumstance or another driver had erred. These are a few of the things that my guy did where he went the extra mile for people's good. He and another officer/counselor had evening meetings at high school's gyms or smaller venues where they talked about personal safety for all and also ones where the officers told parents of teens that, yes, it is illegal to provide alcohol to your child's friends for parties at your home! We had equally difficult and horrible issues with abuse, sexual assault, children being neglected by their parents, etc., etc. Thank the Lord above for conscientious, honorable cops, yes, Christian cops, to protect and to serve with dignity for the individual. There were many times where my mate had to detain, restrain, wrestle, and keep someone from taking charge when he was the one with the authority, who was attempting to do his job for the public. Praise God for first responders: fire, EMT (Emergency Medical Technician), police, counselors, clergy, and other advocates/helpers who put their lives on the line every day in countless ways for others. True Christ-like individuals. I do know there are authorities who abuse their power. They must answer to Jesus Christ Himself one day and to people now, perhaps. God bless you all. THANK YOU SO MUCH. My hope is that every person prays for her/his loved ones! Others! In our daily life, we ask God to help us do each day as He desires for others as well as ourselves. It is hard to describe how the spouse and family of an officer or first responder feels or thinks, most every day you see your beloved walk out the door to go to work. I almost get a lump in my throat writing this today. You pray prior and as they leave; you pray while they are gone, and you pray as they are returning... I am incredibly thankful to the LORD and to others who prayed for my husband- who are mostly his family- our children and sisters, and our church friends. We had and have the prayers of our magnificently living (they did here and now in Heaven) Parents! How they loved and love us. Royce and I can only partially imagine how their fervent and heart-felt, soul-searched, LOVING prayers and requests to Jesus for our Salvation, our daily lives, most including their grandchildren, whom they adore/d, for our ever-increasing closeness to God Almighty, safety, and to do God's will- including spreading the Gospel, the Good News! It is never to be underestimated how one's prayers to God help maintain and times when the prayer saves a loved one or friend, even loving and praying for our enemies, which Jesus told us to do. I am eternally grateful to God that now my husband is retired, and although his work has taken a tremendous toll on himself and our family, Jesus gave him back to us. No one has a loved one for total "keeps". That is, unless everyone involved has accepted the Salvation and Lordship of Jesus Christ as one's loving God and Constant Companion. There were many times early in my husband's career as a sheriff's officer, especially in the mountains where he KNEW that angels of Holy God had gotten him out of life and death scrapes. I am sure of it, also. This happened seven to eight times- that he is aware...! What about all of the times, Royce was unaware of God's Hand and angels upon and around Him? Which Hand Will You Take, Friend?! May Christ Jesus- our God the Father, the Son, and the Holy Spirit- the Triune, One LORD and Savior BLESS and KEEP you beyond what we can imagine and think and watch over you. You have made the most IMPORTANT decision that one can ever, ever make! God grant you peace and to spread the Good News of the Gospel of Christ Jesus!! !